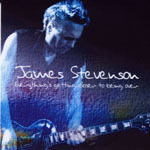 Share the post "Album review: JAMES STEVENSON – Everything’s Getting Closer To Being Over"
For a guitarist with punk and new wave credentials that span Chelsea the revamped Generation X, Kim Wilde, The Cult, Glen Matlock, Gene Loves Jezebel, The Alarm, and latterly Willie Nile, James Stevenson sure has a way with melodies and impacting guitar solos to boot. His songs are positively laid back, but they seduce you with their insistent grooves, swelling melodies and his own relaxed vocal which is given added impetus by The Sexpistilettos, who comprise Maggi Ronson – (Mick’s sister), Traci Hunter (Ian’s daughter) and Elisabeth Westwood. James finds his own voice on material that is glued together by the consistent quality of his playing, an intuitive production and some exemplary pacing. He explores a recurring funky feel on several deeply embedded grooves and short but stellar solos. A phrase from one of James’s vintage guitars speaks a thousand words. This is never better exemplified than his second break on the very funky ‘Give It Up’, as his angular solo cuts through the rhythm track incisively and leads into a shred on the fade out. It’s the perfect example of less is more. His playing is never less than the essential part of a song, as evidenced by the way he switches from lead to unison guitar and then to acoustic, on the undulating melodic ballad ‘Why Am I Still Waiting For You?’, which is eclipsed by a perfectly weighted sax solo that finishes all too soon. This is an album full of surprising, sumptuous melodies and versatile solos that toy with the art of restraint before ultimately letting rip full throttle, without ever losing sight of the arrangement of a song. And while James may have a limited vocal range, the thoughtful production adds double tracking and excellent backing vocals, to provide a consistent dynamic thread at the heart of the album. Even the closing acoustic ballad ‘I’ll Know Where I’m Going When I Get There’, is given sufficient polish to ensure an engaging end-piece to an enjoyable album. He’s also penned a handful of excellent songs, most obviously the very catchy opener ‘Suzi’s Problem’ with its enveloping melodic sweep, grandiose bv’s and epic guitar solo. Then there’s the dreamy ‘Come On People’ – all percolating rhythms, nuanced guitars, muted trumpet and a sculpted, signature guitar part – and the impressive relationship title track. He also finds room for some ironic humour on his anti road tax anthem ‘Go Mister!’. The girly vocals, layered organ and jangling guitars give the piece a hypnotic feel as he summarises his angst with the line: ‘I get a ticket from some bureaucrat to help make his pension fat’. On the equally mesmerising ‘Been A Long Time Now’ he suddenly delivers an electric guitar squall reminiscent of the late Roy Buchanan, just to let you know there is more to the song than a languid drift. It’s akin to an artist leaving his a signature brush stroke, and James has that rare ability to let a song breathe, before drawing you into a smouldering groove and then punctuating it, with a deft solo. In this case the second solo is a beautiful grainy sax over some choppy rhythm guitar on a beautiful fade. It doesn’t get any better than this, and makes you want to stop the album and play it all over again right there and then! It’s followed by the jammed out feel of the splendidly titled ‘Naturally Wired’, in a perfect juxtaposition of laid back cool with gnawing angular riffs and growling guitar driven overdrive. ‘Everything’s Getting Closer To Being Over’ is an album that beguiles you with its understated feel. It counterweights some cool rhythms with tasty solos that are always an integral part of a song. This entry was posted in ALBUM REVIEWS, ALBUM REVIEWS (Mobile), All Posts and tagged Chelsea, Elisabeth Westwood, Everything's Getting Closer To Being Over, funk, Gene Loves Jezebel, Generation X, Glen Matlock, guitar, James Stevenson, Kim Wilde, Maggi Ronson, review, rock, Roy Buchanan, The Alarm, The Cult, The Sexpistilettos, Traci Hunter, Willie Nile. Bookmark the permalink.